Cerebral blood flow (CBF) would be impaired with dual stresses of heat and orthostatic changes, even if those stresses are mild, in the elderly with declined cardio- and cerebrovascular functions with aging. To test the hypothesis, we compared the response of blood flow in the internal carotid artery (ICA) and vertebral artery (VA) to dual stresses of heat and orthostatic changes between the elderly and young individuals. Nine elderly and eight young healthy men (71.3 ± 3.0 and 23.3 ± 3.1 years, mean ± SD, respectively) underwent measurements of blood flow in the ICA, VA and external carotid artery (ECA) via ultrasonography. The measurements were obtained in sitting and supine positions under normothermic (NT) and mildly hyperthermic (HT) conditions (ambient temperature 28 °C). Esophageal temperatures increased from NT (36.4 ± 0.2 °C, mean ± SE) to HT (37.4 ± 0.2 °C) with lower legs immersion in 42 °C water. With heat stress, ECA blood flow increased in both postures in both age groups (effect of heat, p < 0.001), whereas ICA blood flow remained unchanged. 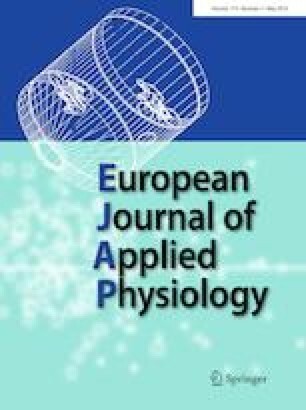 With postural changes from supine to sitting, ECA blood flow remained unchanged whereas ICA blood flow decreased (effect of posture, p = 0.027) by 18% in NT in the young and by 20% in HT in the elderly. VA blood flow remained unchanged under both heat stress and postural changes. The CBF is impaired under dual stresses of heat and orthostatic changes in healthy aged individuals, even if the levels of the stresses are mild. We are very grateful to the volunteers who participated in this study. We also thank Dr. Yoshihiro Yamashina and Mr. Yoshikazu Hirasawa from our laboratory for useful comments and suggestions regarding this manuscript. This study was supported in part by a Grant-in-Aid for Scientific Research (C), Grant number 17K01656 (to A. Ota), and by a Grant-in-Aid for Scientific Research (B), Grant number 17H03741 (to K. Okazaki) from Japan Society for the Promotion of Science. AO contributed to the design of the experiment, data collection, assembly, analysis and interpretation, and drafted the article; RT, DI, NN, EK, KS, EM, YS, and HY contributed to data collection, analysis and interpretation, and revised the article; TM contributed to data interpretation and revised the article; KO contributed to the conception, the design of the experiment, data interpretation, and revised the article critically for important intellectual content. All authors approved the final version of the manuscript.